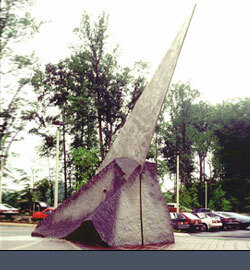 Commissioned by the Super Computer Research Center and installed in Bowie, MD just outside of Washington, DC. The work is a sundial and solstice calendar with the unique feature of a correction annalema which compensates for the difference between local solar time and Eastern Standard Time. Located at the entrance of the building, the hour dial and calendar features can be seen and enjoyed from many locations inside the building.